Welcome to our new travel blog. Where do our readers like to go? Please tell us about your favorite California travel spots with one or two images to share, and we may post them here. Burbank is considered the "media capital of the world," and this vibrant California town is full of attractions and entertainment surrounding its culture of film and theater. While many people are familiar with the more popular studios in Burbank, check out these hidden gems you may not have known found their home in Burbank. 1. The Ellen Show - If you've ever dreamed of being an audience member for a taping of "The Ellen DeGeneres Show," but didn't know how or where to go, you can finally put those plans to action by visiting Burbank. The Ellen Show is filmed at Warner Brothers Studio, which is located in Burbank. Laugh your head off at her hilarious celebrity interviews or marvel at the incredible stories and talents of ordinary people invited to share on her show. You could also get lucky with some of her amazing audience gifts and giveaways. 2. Martial Arts History Museum - You won't find this kind of museum in most towns. Visiting the Martial Arts History Museum is a one-of-a-kind experience, and something the whole family can enjoy. Learn about the history of various styles of martial arts and how they influenced the culture and development of countries, including the United States. This museum was designed by artists from the Walt Disney Company and DreamWorks, so you know it will be a sight to behold. 3. Flappers Comedy Club - From seasoned greats to up-and-comings, see the best acts in comedy as they perform center stage at Flappers Comedy Club. There are always Comedy Central stars and national headliners, but you may also be privileged to witness some of the first work of potential superstars of the comedy world. 4. Big Mama's and Papa's Pizzeria - There are a lot of restaurants and food joints to choose from in Burbank. If you're walking or driving around, it can be hard to know which will be a good, memorable eating experience. Know before you go by planning to eat at Big Mama's and Papa's pizzeria. The name might ring a bell if you watched the Grammy Awards in 2014 - when Ellen DeGeneres herself was the hostess and ordered pizza right from the stage. 5. Audrey K Boutique - For a shopping experience you won't find anywhere else, you have to stop in to Audrey K's when you visit Burbank. This eclectic boutique features designs from local designers and also exclusive designs created by Audrey herself in the LA valley. If apparel isn't on your list, don't worry - you can find books, home décor, and more at Audrey K's, as well. Glass Beach is a beach in Fort Bragg, California that is abundant in sea glass created from years of dumping garbage into an area of coastline near the northern part of the town. 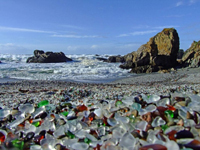 In the early 20th century, Fort Bragg residents threw their household garbage over cliffs owned by the Union Lumber Company onto what is now Glass Beach, discarding glass, appliances, and even vehicles. Locals referred to it as "The Dumps." Fires were lit to reduce the size of the trash pile. The California State Water Resources Control Board and city leaders closed the area in 1967.Various cleanup programs were undertaken through the years to correct the damage. Over the next several decades the pounding waves cleaned the beach, by breaking down everything but glass and pottery and tumbling those into the small, smooth, colored pieces that cover Glass Beach. In 1998, the private owner of the property determined that Glass Beach should belong to the public, and in 2002 it was incorporated into MacKerricher State Park. The beach is now frequently visited by tourists. Collecting is not permitted on the park's beach, although sea glass can be found on other local beaches outside the park boundary. A Glass Festival is held annually on Memorial Day weekend. The Trona Pinnacles is one of the most unusual geological features in the California Desert National Conservation Area. They grow at an elevation of 1,800 feet above sea level and are located approximately 10 miles south of Trona, California. The unusual landscape consists of more than 500 tufa spires (porous rock formed as a deposit when springs interact with other bodies of water), some as high as 140 feet, rising from the bed of the Searles Lake (dry) basin. They now sit isolated and slowly crumbling away near the south end of the valley, surrounded by many square miles of flat, dried mud and with stark mountain ranges at either side. The Pinnacles are recognizable in more than a dozen hit movies. Over 30 film projects a year are shot among the tufa pinnacles, including backdrops for car commercials and sci-fi movies and television series such as Battlestar Galactica, Star Trek V: The Final Frontier, Disney's Dinosaur, The Gate II, Lost in Space, and Planet of the Apes. Access to the site is from a BLM dirt road (RM143) that leaves State Highway 178, about 7.7 miles east of the intersection of State Highway 178 and the Trona-Red Mountain Road. The 5-mile long dirt road from State Highway 178 to the Pinnacles is usually accessible to 2-wheel drive vehicles, however, the road may be closed during the winter months after a heavy rain. They are well worth the visit. Located in the town of Pacifica, California, the site of the discovery of San Francisco Bay consists of the point at which the Portola Expedition, 1769, crossed over Sweeney Ridge, and for the first time, came to view one of the world's largest sheltered anchorages. From the top of Sweeney Ridge one can see not only inland to the Bay, but north along the ocean coast as far as Point Reyes. In late October of 1769, Captain Gaspar de Portola and his party of sixty men (with a caravan of 200 horses and mules for riding and the pack train) had come from San Diego in search of Monterey Bay, but from their overland approach, they had failed to recognize it. On November 1, 1769, Sergeant Ortega with a squad of scouts began a three-day reconnoitering tour. Somewhere along the five mile stretch between Mussel Rock and the summit (Point Reyes), Ortega saw San Francisco Bay on his first day of scouting. Three days of slow travel then brought the expedition to the site of modern Palo Alto where a new base camp was made to await Ortega's probing of the east side of the estuary. Ortega returned in four days with discouraging news. He observed great stretches of burned-over land leaving no pasture for the expedition's livestock. A council was then called and the decision was made to return to San Diego. The Portola Expedition ultimately accomplished its purpose of finding Monterey Bay. The San Francisco region was further explored by Lieutenant Pedro Pagas in 1772 and by Juan Bautista de Anza in 1776. The importance of the inland bay was further emphasized by the establishment of a presidio and two missions in the environs of the bay. Today, the site of the discovery of San Francisco Bay consists essentially of two knolls from which the member of the expedition acquired the view. There are two commemorative monuments that celebrate the Gaspar de Portola Expedition. The Portola Site monument, shown here, was erected in 1968 when the site received its National Historic Landmark designation. Please tell us about your favorite California travel spots!